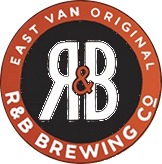 R&B have been brewing finely made, hand crafted ales and lagers in the heart of East Vancouver’s historic Brewery Creek district for over a decade, with a commitment to keeping things modest, independent, and unique. R&B Brewing Co. has always been, and will always be, just about as independent of a microbrewery as you’ll come across. Founded in 1997 by longtime friends and co-workers Rick Dellow and Barry Benson (the ‘R’ & ‘B’, respectively), R&B Brewing Co. was set up to stand in opposition to what the beer world had become – big, non-descript, faceless, and corporate.